This wonderful dresser tray set was made by Tiffin Glass Company during the 1930's. The pattern is called 'Chipperfield' for it's geometric pattern. The set has 3 parts: the tray, the round insert and the lid. Both the lid and insert are in perfect condition, while the tray has a couple of rough spots on the inside edge where the insert fits. (Notice that the insert has the space for lipstick and rouge molded into the glass.) Overall excellent condition. This tall candy jar & cover was produced by Tiffin Glass Company during the late 1920's. It's shape #15179 and stands 7 1/2 inches high to the top of the lid finial. 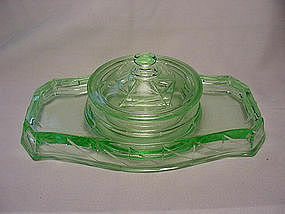 (The base is 5 1/2 inches high) The glass is green with an all over satin finish. Excellent condition.